I planted my garden! We had fantastic weather this weekend, perfect for playing in dirt, so I went to the garden store and got seeds and potting soil. Unfortunately the entire city had the same idea, and I hate crowds, so I didn’t spend any time browsing for random plants. Hm, maybe that’s a good thing. Sometime this year I plan to turn the spot where the pots are into a second vegetable bed, put slightly taller wood frames around both beds to help with weeds, fence them with space between for a path, and put in a gate. That should look much nicer than what I have now. I’ll still need the wire rabbit fencing, but if it’s attached to a more attractive fence and I’m not pushing against it all the time, it shouldn’t detract too much. This is in my front yard, and my neighbors would probably appreciate some effort. All I have in the backyard now is the rhubarb, which has just starting poking leaves up. I’m tempted to rake out the leaves and plant my leftover seeds from last year just in case they decide to grow, but there are probably better uses for that time (like installing a fence…). I also finally repotted some of my house plants. The parent plant suffered a drought (a common occurrence in my living room) and died from the roots up, so I cut off the surviving stems and have been rooting them in glasses of water. For a really long time, because I didn’t have any potting soil. They did pretty well in the glasses, but they look nicer in pots. Yes, it’s a garden update in December. Hey, if I’m eating fresh tomatoes from my garden, I can post about it. They aren’t vine-ripened. I picked them in late October and they’ve been ripening at the rate of 1-2 a week. Since they are tiny cherry and grape tomatoes, all I’ve been doing with them is tossing into my lunch salads. Speaking of salads, arugula! It did better last year, but it’s still growing happily. Next year instead of mixed greens I should just plant arugula in the fall, because the others never sprouted. Also still growing (and going in my salads): chard. I hope it does this well again next year. Note to self: You planted it in early April. Do that again. I also have a volunteer dill. The original dill (which were all volunteers from last year) died a while ago, but this little one still seems happy, despite a few light frosts. That’s all that’s still growing. I pulled all of the fennel on 11/25 and cooked the stalks with some chicken. Dumped compost all over the garden, narrowly missing the arugula. Once the last of the greens are done I can add the rest of the compost and start a new pile in its place. My old pile’s pretty full. And of course I’m already making plans for next year. * Chard loves me this year. I planted both white-stemmed chard and colored-stemmed chard. I’ve got one nice yellow-stemmed plant, some tiny red-stemmed ones, and many giant white-stemmed ones. The white-stemmed chard definitely grew much better. * Swallowtails love me too. Last year I planted a bunch of extra fennel for the caterpillars and never saw any. This year I didn’t plant extra, and there are at least half a dozen giant caterpillars munching away on it. I’d have a photo for you, but my camera refused to focus. I finally ripped out my bolted lettuce a few weeks ago. The dill’s all gone to seed–twice–and the stuff in the back garden is long dead. That must mean it’s time to plant for fall. This weekend I planted more mesclun and beets. I see more salad in my future. The chard is still growing happily, but considering how much it cooks down, we get about two servings a month. Tomatoes are still plugging away. The lemon drop plant has been doing especially well. The Japanese black trifle only recently starting producing green tomatoes; I lost one to blossom end rot but I’m hoping the others make it. I’m already thinking about next year–giving up on the back garden and planting many more greens in pots in the front. Greens seem to do the best for me. Good thing I like them. We have chard! I’ve been planting it for a few years, and this is the first time it’s grown. It’s beautiful – big dark green leaves and thick crunchy stalks. I planted multicolored chard–you can see some yellow and red stalks if you click through to the larger photo–but most of what came up is white. That’s ok. It all tastes the same. We sauteed some last night, and it was good. I’m so glad it decided to grow this year. The chard is happy, the mesclun is happy, though the arugula, mustard, and something else have bolted. The lettuce is in great shape. I removed flowers and picked a bunch of things for my lunches this week. The dill is gigantic–taller than me. There are actually three plants, two tall ones and a third smaller one. I cut off some of the flowers in hopes of getting more leaves, but I like having the seeds too. And my purple coneflower is blooming! Two flowers today, and a ton more buds. It has so many stems that it looks like a shrub, and it’s almost as tall as the dill. I might not bother planting the back garden next year. It’s very shady, and doesn’t produce much, so it doesn’t seem worth the effort. I’d like to add a second bed in the sunnier front yard, though not until next year or 2014. I do have some large pots that I didn’t plant this year, so I could use them next year for whatever I would have planted in the back. Mostly more green leafy things. I didn’t put cages around these when I planted them. I kept thinking “next weekend”. Now they’re on the big side to be adding cages…this will be interesting. Three of them are flowering already. All four of these are ones I got from someone at work who started seeds. I have a Japanese Black Trifle, Lemon Drop, Super Snow White, and something red (Austin’s red pear, I think). I hope they do well and the squirrels don’t eat them. Mint…and a lot of weeds (I was going to do a bunch of gardening this weekend, and then realized next weekend is a 4-day weekend and would be a much better time). The shorter mint on the left is lemon mint. The tall stuff in the middle and spreading to the right is apple mint (in front of the tall green thing (pokeweed)). The lime mint is barely visible in front of the apple mint to the right. You can just see a few purple chive flowers on the right. I wanted to see which would win, the chives or the mint. Clearly it’s the apple mint. 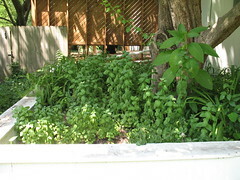 Behind the apple mint are leaves from the day lilies. What you see very few of are other weeds in the mint patch. Success! I still want to add spearmint and/or peppermint to this area as well. In the front right we have more chives in a pot. 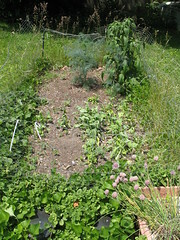 Behind the chives, on the right, that’s mesclun, wilting in today’s 89-degree heat. I am going to have watered everything by the time you read this. 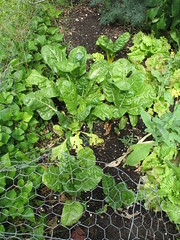 To the left of the mesclun, chard, doing better than any chard I have planted before. 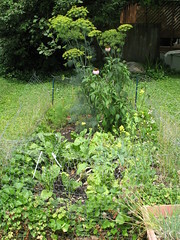 The two tall green feathery things are the self-seeded fennel; you can’t see the fennel I planted very well in this photo. The really tall green thing is a purple coneflower. Behind it is…a yellow flower. Both are native plants that I got last summer. 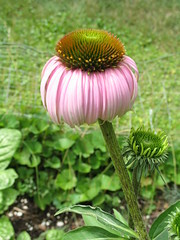 Neither bloomed last year, but the coneflower is budding now. The yellow flower still only has about four leaves, but last year it only grew two, so that’s an improvement. Front left is my rhubarb, which still doesn’t seem big enough to eat. In the back, the row goes radishes, lettuce, more radishes. On the right, from back to front is more lettuce and more radishes, with shallots along the edge. In the middle is a clump of spinach. 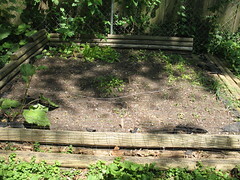 The chard in this garden didn’t come up, and very few of the beets came up, which is why there are big bare patches. To the right, out of view, are the potatoes. Apparently I missed a few when I dug them up last fall. So we have a lot of mint available. Some of it got used in a mint chutney from the Joy of Cooking, which I used on leg of lamb. A bit got turned into mint juleps Saturday for the Derby, which I won’t bother with again next year (not a bourbon fan to begin with). Put the mint, milk, and sugar in a sauce pan. Heat it over medium until warm but not simmering. Let it steep for several minutes, stirring often, until the sugar’s dissolved and the milk tastes minty. Pour into a bowl through a strainer. Press all the liquid out of the mint leaves and discard. Refrigerate the milk overnight. The next day, add the cream and pour the mixture into the ice cream maker. Let the magic happen. My spinach and lettuce are starting to look like baby spinach and lettuce, adorable. The spinach didn’t do well enough to need thinning, but the lettuce will, maybe this weekend. I filled in the last empty area of dirt with a different kind of radish a couple weeks ago and have seen no sign of the sprouts so far, but radishes seem to take a while. The tomatoes seem happy, even the one I originally didn’t plant because I thought it was dying. I guess being in a pot with more dirt means more water to keep it happy. Soon I should pick a couple stalks of rhubarb and see what I can make with such a small amount. I’m envisioning a tiny cobbler. Two weeks ago I started this year’s garden. My lettuce and radish seedlings and the shallots are big enough to see from the window. And my spinach has sprouted! I’ve had terrible luck with spinach. Must be an Easter miracle. Very few of the beets are up, and the chard is nowhere to be found. Two volunteer dills are doing well, as is the sole leftover/volunteer endive. 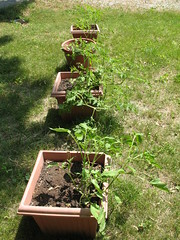 I got my tomatoes, but one has died, and another is ailing, so I might need to get more from the garden store. Along with my eggplant and rosemary. Of course, I was at the nursery this weekend, but I only got ornamentals, which I’m hoping to plant Wednesday. This weekend, I put in: fennel, mesclun, more lettuce, more radishes. And more chard, which I don’t expect much from. It’s a good thing I like salad.